Head lice are parasites. The are grey/brown in colour and measure approximately 2 to 4 mm. Nits are the eggs and empty egg shells. Head lice nest in hair close to the scalp. An adult louse lives for 3 to 4 weeks. The eggs and egg-shells are white. The lice move about, crawling close to the scalp. 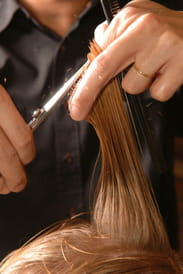 Nits remain stuck to the hair shaft and are difficult to remove. Head lice are very common in children and more commonly boys. The presence of lice is not caused by a lack of hygiene, it is a very common problem. Lice cannot hop, jump or fly. Lice die if they are away from the head for more than 24 hours. Head lice and nits are found on the scalp, behind the ears, on the nape of the neck and on the top of the head. The lice walk from one persons head to another. They prefer short hair to remain close to the scalp. There is no preventive treatment to avoid lice. Check for lice if your child has been in close contact with another person who has lice. Check every few days for approximately 2 weeks. A detection comb is the recommended method. Wet combing - after washing the hair, use lots of conditioner and proceed to comb the hair in sections starting very close to the hair roots. Check the comb for lice and nits after each stroke and wipe any away. Wash the conditioner away after completing the whole head. Various types of head lice products are sold at chemists. There are several effective treatments to get rid of the lice and nits: get advice from the chemist or your GP. Wet combing on its own is an effective treatment but needs to be repeated every 4 days for 2 weeks. Follow carefully the administration instructions. Only use a nit comb. Apply the lotions only if you see living moving lice. Nits (empty egg shells) can remain after treatment therefore can be removed with a nit comb. Do not leave the lotion on the head for more than the period of time stated. Ensure that the whole scalp is covered with the product, sectioning off each portion of hair. Don't forget to apply the product to hair behind the ears and in the nape (back of neck). Rinse thoroughly after the recommended exposure time. Remove the dead nits and lice with a nit comb. Check family members for head lice and if they have lice then all family members need to be treated at the same time. Cutting the child's hair makes it easier to apply the treatment as well as use the comb. This document, titled "Head Lice ," is available under the Creative Commons license. Any copy, reuse, or modification of the content should be sufficiently credited to CCM Health (health.ccm.net).